Public Markets | Nicholas Hoffman & Co.
Apples on the Dark Side of the Moon? Last Wednesday was an interesting day in the news and maybe even a harbinger of the future. Two news items caught my eye. First, the Chinese successfully landed Chang’e 4 on the dark side of the moon: a first for any space program. There have been numerous missions in recent years to the Moon, but few have actually landed. The last crewed landing was Apollo 17 back in 1972. Chang’e 4 was carrying instruments to analyze geology, and materials to set up biological experiments. Six plants (cotton, rapeseed, potato, fruit fly, yeast and a flowering plant called Arabidopsis) were transported with the plan of forming a mini biosphere. The landing is seen as a major milestone in space exploration. Kudos to the Chinese! The other news that caught the world’s attention was Apple’s sales guidance on their upcoming Q1 2019 quarter. Apple now expects first-quarter revenue of $84 billion which is well below previous expectations of $89-$93 billion. The surprising announcement caused Apple’s shares, and the whole stock market, to plunge the next day. Apple CEO Tim Cook sought to explain the reduction by reference to a slowing Chinese economy and reduced demand for high-end items like iPhones. It seems the smartphone business is quickly maturing. Global smartphone shipments have declined for four successive quarters. What’s most interesting about Apple’s remarks was what Cook did not say. For example, he did not mention that Chinese smartphone maker Huawei shipped more smartphones in China than Apple for the second consecutive quarter. Moreover, Huawei smartphone shipments in China for Q3 2018 were 30% higher than the same period in 2017, while Apple’s were pretty much the same. The Chinese smartphone market is the largest in the world, and accounts for one third of global sales, so much is at stake for the top three players: Samsung, Huawei and Apple. The news about Apple and the moon landing was very vivid to me as I am reading “AI Superpowers” by Kai-Fu Lee, who was formerly head of Google China. The book explores the role Chinese innovation and entrepreneurialism will play in tomorrow’s artificial intelligence wars. No longer are Chinese engineers copying our innovations but creating their own. In his book Lee explains the “then” versus “now” of Chinese entrepreneurship and engineering. Twenty years ago, top Chinese engineering students paddled hard upstream with used, out-of-date textbooks and 8 pm “lights out” dormitory rules. Lee argues that the Chinese engineers of today have quickly caught up to our engineering caliber and are poised to compete head on. He further argues why Silicon Valley is not well prepared to battle the Chinese “gladiator trained” entrepreneurs. The development of Chinese innovation and entrepreneurial prowess is real. With the Chinese stock market now at more reasonable valuations, perhaps we should be thinking less about the FAANGs (Facebook, Amazon, Apple, Netflix, Google) and focus more on the Chinese BATS (Baidu, Alibaba, Tencent), and the role these Chinese entrepreneurial companies will have in shaping the future. 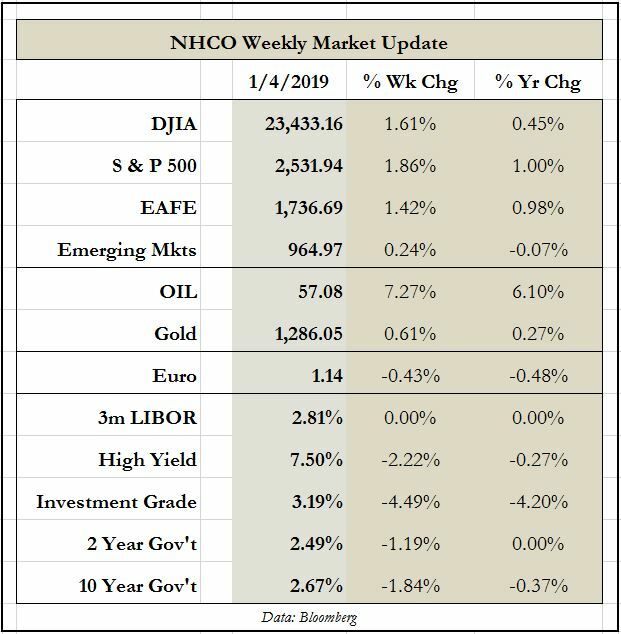 This entry was posted in Public Markets, The Weekly and tagged Apple, China, Huawei on January 7, 2019 by nhoffmanandco.